The HSUS’s #MeToo problem should come as no shock. 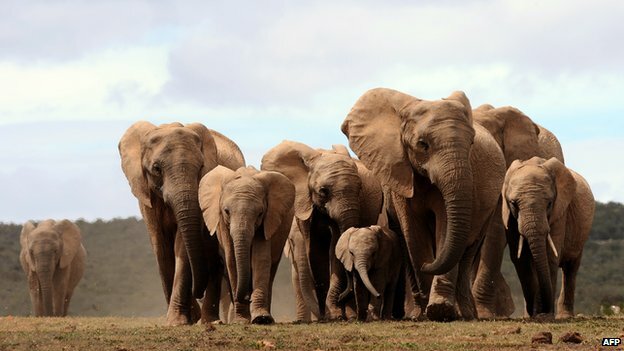 This mega-charity has a history of manipulating the very beings it’s trusted to protect. Full article published in the 7 Feb. 2018 issue of CounterPunch. The full article, including historical commentary by editor Merritt Clifton on notable animal-protection proponents whose social lives would not win Duke’s approval, appears here. 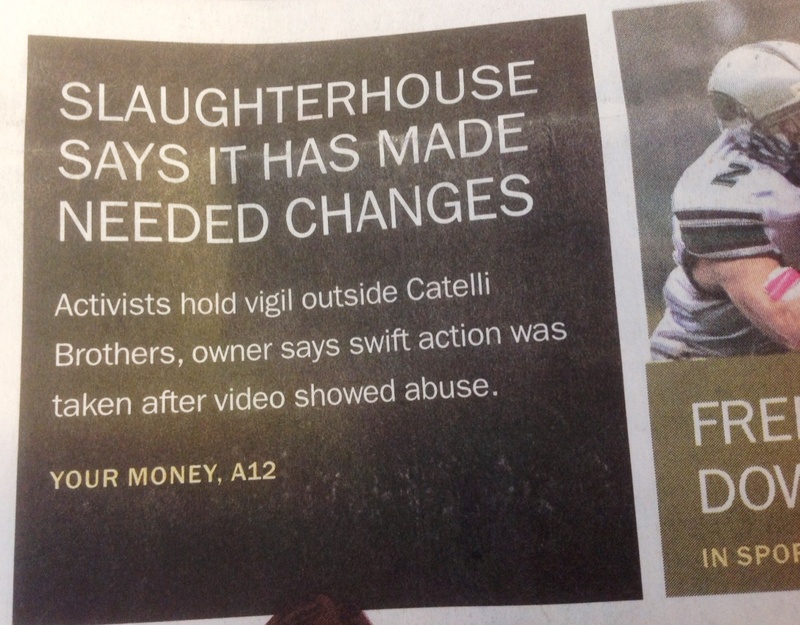 Here’s a recent article headlined “Slaughterhouse Says Changes Made” by the Asbury Park Press, based in New Jersey, where the president of Catelli Brothers took “swift action” after an undercover video showed abuse of Holstein veal calves. 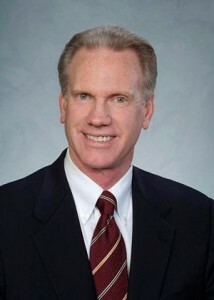 Anthony Catelli is also quoted reassuring the public that the plant, in operation for 19 years so far, was designed to follow the humane slaughter methods developed by Professor Temple Grandin. Three workers were fired, and eleven new cameras will watch the rest of them. Essentially, all that has changed is who monitors the employees. “Ag-gag” bills—laws forbidding outsiders from recording workers in animal agribusiness—are receiving some attention because of their serious civil-rights implications. (Harold Brown and I will speak about such bills with criminal justice students at an open event in West Chester, Pennsylvania next week.) Far less noted is how undercover investigations become exposés of grotesque scenes that are, at best, met with a tidying-up of the system at a particular business. That hardly challenges an industry. Deliberate nastiness on the part of employees, after all, does nothing to preserve or augment the owners’ profits. Moreover, undercover actions to expose abuses in a slaughter plant send the message that there’s nothing inherently abusive in killing. If the law is followed, there’s nothing for activists to find. Another disturbing element involves the process by which the undercover videographer got this imagery. According to this story, the person filming on behalf of the Humane Society of the United States was more than a passive witness to the harrowing scenes recorded. HSUS spokesperson Mary Beth Sweetland says “our investigators do not participate in ill treatment of animals” and that the company, by stating otherwise, is throwing up smokescreens. 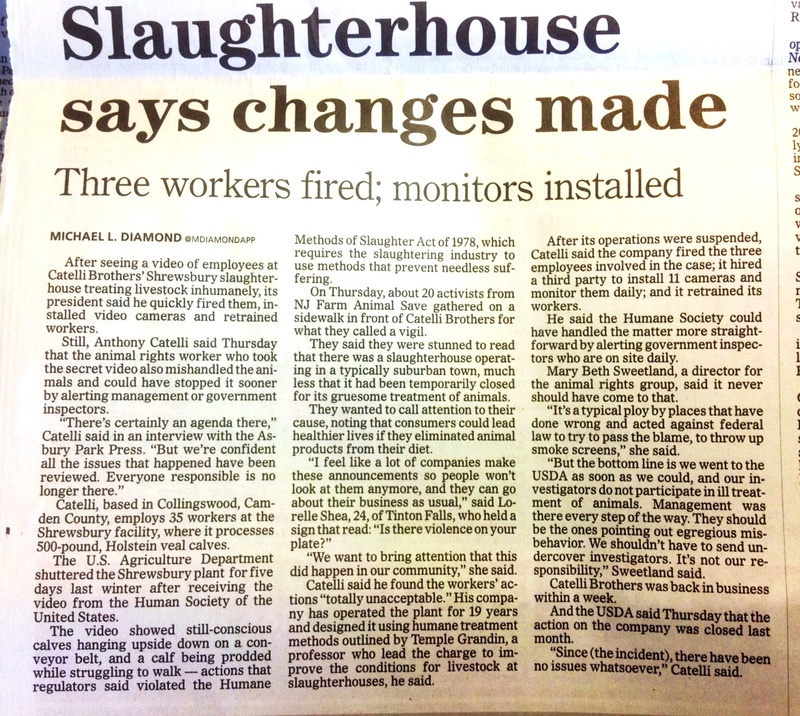 In either case, HSUS sent an employee into a job at this animal processing plant to obtain images. Direct involvement in the handling and killing of animals can go on for weeks in some undercover projects. 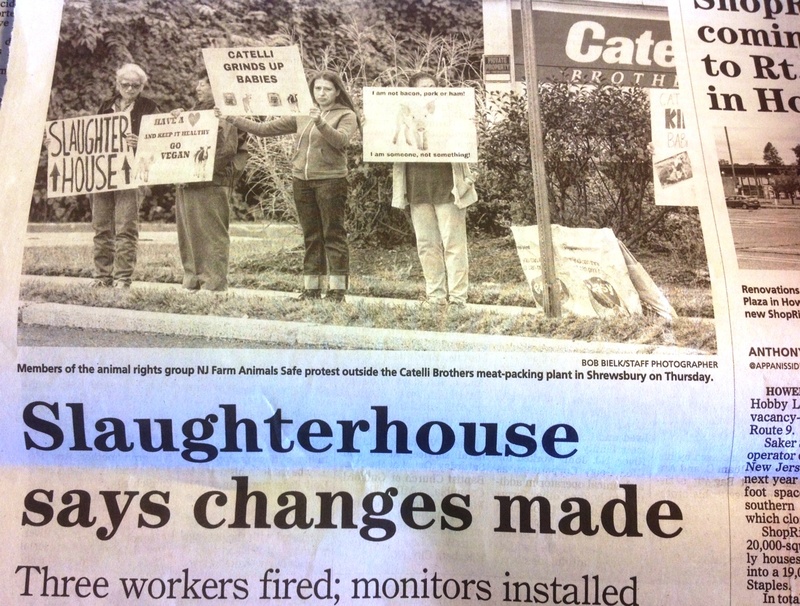 What about the people who gathered in a public demonstration outside the slaughter plant? As the photo shows, they’re with a group named NJ Farm Animals Safe. At least one has a vegan placard. Good. A vegan shift is the only thing that’ll stop the production of Holstein veal calves. Of course, the protesters could be standing in front of countless places like this; a bust doesn’t need to happen for vegan outreach to be done. In any case, thanks to them for displaying the vegan message. Last winter, the U.S. Department of Agriculture suspended operations at Catelli Brothers for five days after the Humane Society of the United States submitted evidence of violations of the Humane Methods of Slaughter Act of 1978, which, originally passed in 1958, was enacted to prevent needless suffering. Even if it could be enforced throughout the country, the Humane Methods of Slaughter Act would have limited scope. The U.S. government and many States regulate the transport and slaughter of mammals in agribusiness, but few if any jurisdictions address breeding and husbandry in all other phases of the animals’ lives. If, and only if, we stop buying dairy milk and cheese, the suffering stops. Nowadays I can point to vegan cheeses offering any taste or texture people might want, but let’s grow up. Good vegan cheese is a bonus for us. Not a need. And we needn’t be a society of bullies. The death of newborn animals so their parents can keep lactating to fill our breakfast bow ls is needless suffering. Available: An online copy of the newspaper article. Welcome to Vegan Place. You’re reading the best entry ever posted here. Mind you, I wanted Vegan Place’s opening entry to be uplifting, encouraging, and beautiful. But it is not. Because this morning, the CEO of the Humane Society of the United States dropped a heap of disgraceful words about the group’s latest “victory” into my in-box. Well, something needs to be said about that. As in: If this is a humane “victory” what do the defeats look like? Here’s the e-mail. The bold highlighting is there in the original. And here’s my bold highlighting: This is the codification of online mass pet retailing. I have a huge victory to share with you! After years of pressure from The HSUS, and hundreds of thousands of emails and support from advocates like you, online puppy mills will finally be subject to federal inspections and oversight. The U.S. Department of Agriculture announced plans today to ensure that large-scale breeding facilities that sell puppies over the Internet, by phone, or by mail are licensed and inspected regularly for basic humane care standards. This rule will also apply to large commercial breeders of other warm-blooded pets, such as kittens and small mammals. We are so grateful for the actions of our advocates. When we stand together, we can make a tremendous difference for animals on a national level. Pacelle goes on to thank the Obama administration, the “strong bipartisan support in Congress for closing the `Internet loophole` in the Animal Welfare Act regulations”, and the USDA, which will assign people to license (yes) and inspect the animal vendors. Of course not, if the world’s most influential humane-treatment group makes a campaign out of codifying them. The HSUS hereby marks its role as the federal regulatory regime for online retail animal sales is rolled out, and declares its key position in deciding who in the industry is not carrying out the sales according to that regulatory regime. The establishment of the industry-regulating role will be followed by the correlative industry-policing role. Thus, administrative regimes are created with the help of the humane-treatment sector and they beget more jobs in the humane-standards field–an industry upon an industry. University classes are now being created and offered to prepare students for roles in refining animal breeding, use and handling. 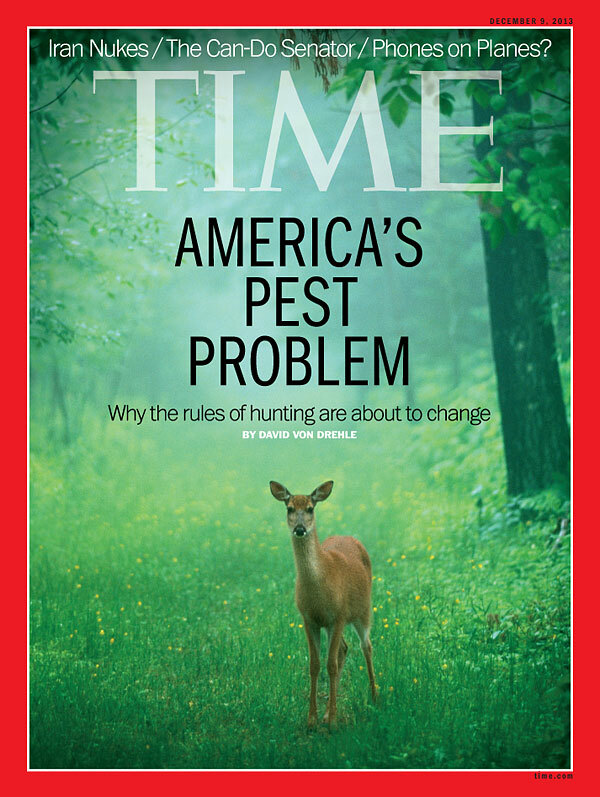 To say their aspirations to a humane, sustainable ideal amount to a lot of fairy dust would be to understate the actual harms done when the exploitation of animal life is continually hardened into the system of administrative law and custom. It’s a gorgeous day, the moon has already risen, and I need a run. Thank you for reading. In later posts I’ll try, in the famous words of Harold Chasen’s mother, to be a little more vivacious.